Taipei, June 14 (CNA) The New Taipei City government and the Philippine Representative Office in Taiwan jointly held a mask carnival at the public square in front of the New Taipei City Hall Sunday in celebration of Philippine independence day. 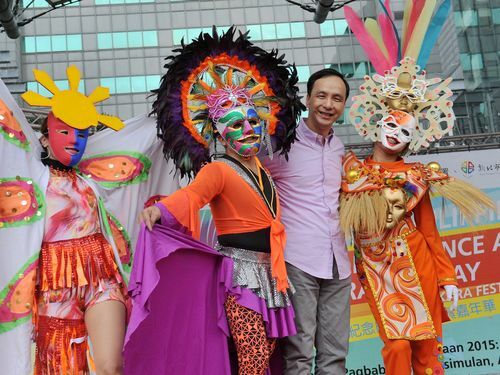 The festive carnival, hosted by New Taipei Mayor Eric Chu (朱立倫) and de facto Philippine ambassador in Taiwan Antonio Basilio, drew crowds of local people and Filipinos with musical and dance performances as well as a dazzling mask parade. Chu said he was happy to celebrate the Philippine festival along with new immigrants from the Southeast Asian country. He also expressed thanks to the Filipino workers who have contributed or are continuing to contribute toward the development of New Taipei. New Taipei is home to 81,186 foreign workers, and 10,704 of them come from the Philippines, Chu said, noting that apart from these workers, there are also 1,368 new immigrants from the Philippines, who now live in his city. The Philippines declared its independence from Spain on June 12, 1898. Since 1962, the country has observed that day as its national day.